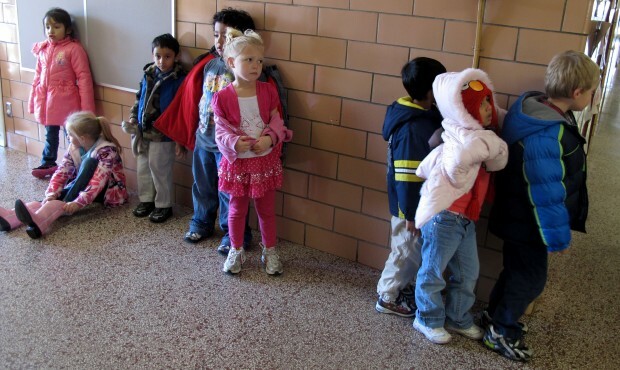 Students line up in the hall after recess at Busy Bees Academy, a public preschool in Columbus, Ind. 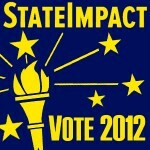 Whether Indiana should pay for preschool has become a key issue in the 2012 gubernatorial campaign. 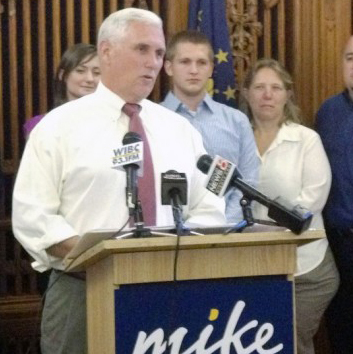 Republican Mike Pence says the state should build on existing community programs. Democrat John Gregg wants to start a state-funded pilot program to expand access to early education. But a Columbus-area group thinks it has an idea that combines both platforms: Partner with local businesses to build a preschool program with the school district. Use a lottery to enroll low-income families. Provide kids with scholarships to attend private and faith-based programs in the community. Then ask voters to kick in through a property tax increase. Every year about 900 kids enter kindergarten in the Bartholomew County School Corporation. Burnett estimates roughly a third of them aren’t ready to start school. That’s a problem he says can set kids back for the entirety of their K-12 career. Indiana is one of 11 states without dedicated funding for early education. Columbus’ solution to the pre-kindergarten problem is Busy Bees Academy, which opened in 2009. The preschool is a project of the Community Education Coalition, a partnership of school, business and community leaders that tries to align learning opportunities with economic development. The group had long invested in high school and higher education. But Burnett says the coalition began to see funding for pre-kindergarten programs as vital to Columbus’ prosperity. Half of the students attend Busy Bees on a $5 a week scholarship. Interested families — there were about 250 last year — compete in a lottery for 90 spots. The school’s 90 other students pay full tuition, $80 per week. The first year there wasn’t a waiting list for paying families. But Busy Bees has become so popular that there’s now a lottery for those spots, too. For low-income students who don’t get a spot through the lottery, the Community Education Coalition also provides scholarships for students to attend partnering private and faith-based programs. This year, the group raised about $100,000 to enroll 75 kids at other preschools in the community. “We have a lot more students that are wanting scholarships than we have spots available for,” says Busy Bees Executive Director Cathy King. The school provides additional support for low-income families. There’s a social worker and family-school partner on site to help with everything from kindergarten preparedness to problems with employment, housing and transportation. “We feel like if the family’s not successful, then the student’s not going to come to school ready to learn and ready to be successful so we want to figure out as many of those issues in the year we have those students so when they go to kindergarten they’re ready and their families are ready,” says King. About 20 percent of Busy Bees students are English language learners. King says early education gives those students a chance to get caught up with their peers before they ever fall behind in school. In every classroom, there’s one teacher and two aides for every 15 or 16 students, which allows the adults to work individually with the students. “It’s a lot less expensive to put on a program like this than it is rehabilitate the students for the next 12 years,” says King. So the Bartholomew County School Corporation is asking voters to approve a property tax increase of five cents per $100 of assessed valuation — or $16 a year for a $100,000 home, says Burnett. If it passes, Busy Bees will be able to add capacity for another 200 or so students. If all this sounds familiar, it’s probably because you’ve heard Mike Pence talking about Busy Bees on the campaign trail. The preschool is one example of the kind of public-private partnerships the Republican gubernatorial candidate says he’d support if elected. 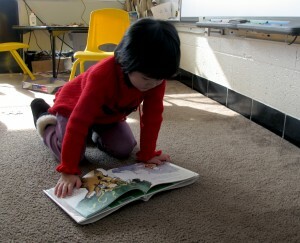 A student at Busy Bees Academy, a public preschool in Columbus, Ind., reads a book about animals. “My one overriding principle is that I don’t want to replace what is happening in communities around the state of Indiana — faith-based organizations, private philanthropy organizations, simply private efforts supported by local businesses to provide pre-K programming for our kids,” Pence told StateImpact. A state-run pre-kindergarten program would likely cost between $3,500 and $5,000 per student, but Indiana lawmakers say there’s just not money in the budget for it. 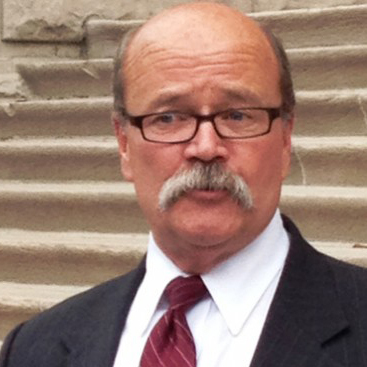 Pence’s opponent, Democrat John Gregg, has proposed a pilot program in 40 schools. “What everybody tells me — all the experts, anything you read — is that the more money you spend in the Pre-K years, the early childhood development, I’ve heard that for every dollar that we put in, by the time that student is through school, we’ve seen a $7 return on that,” Gregg told StateImpact. Early childhood education is one of those few areas of social policy in general, not just education, where we know that with a well-designed early childhood program, every dollar spent saves you multiples of dollars 20 years later. It’s a wise investment. It’s a fiscally conservative investment. It’s something that can please everyone because everyone benefits for a lot of different reasons. But it costs money. But it just costs money. Even after people in the state of Indiana on both sides of the aisle decided that full-day kindergarten was a good thing, it took us years to get the funding in place.